With so many applications and web services, one has to remembers loads of passwords. Sometimes, few passwords slip out of mind while they are still stored in different applications. In such situation, you can recover passwords hidden under asterisks using free utility Asterisk Key. It can easily recover and reveal passwords on different dialog boxes and web pages. It also supports multilingual passwords. 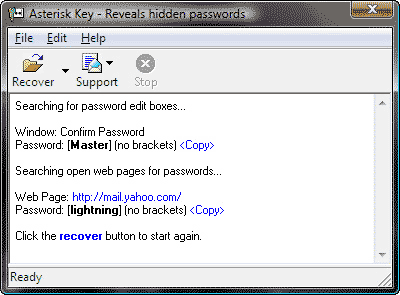 Download Asterisk Key [link] to uncover and reveal passwords hidden under asterisks. No more tension, if you forget few passwords. Use discretion, this utility is meant to recover own passwords and NOT steal passwords – don’t be naughty! How to Recover Wireless Keys (WEP, WPA) on your PC ?